Our country the United States of America is wheelchair friendly though it does have locations where wheelchair users have a difficult time obtaining access. The reason the majority of historical places or government buildings are some of the least accessible in the United States of America is that wheelchairs were not as popular as they are today. Many of these types of building were built many years ago and its purpose was not primarily to serve those in wheelchairs. Let’s keep in mind that wheelchair users did not have as much independence as they do today due to features added that facilitate their daily routines. However, many government buildings are big enough where wheelchair users can easily move around in and have been modified to provide ramps for wheelchair users to gain access to the building that only had stairs. Newer buildings are designed with wheelchair ramps and elevators to allow those in wheelchairs to access it. Thanks to these ramps and elevators many injuries have been prevented over time. Ramps and elevators help those in wheelchairs feel more welcome and accepted because they are considered. These types of buildings also help wheelchair users become more independent because many are capable of gaining access to these building on their own or with the help of an electric wheelchair. Government buildings have created accessible ramps and elevator, so has major theme parks. Theme parks are designed to provide access to those who are in wheelchairs and those pathways get them directly to the front to avoid getting stuck in the regular lines. Theme parks have taken the initiative to create bathrooms that have a large stall specifically for wheelchair users. Some even created separate individual restrooms for those in wheelchairs. 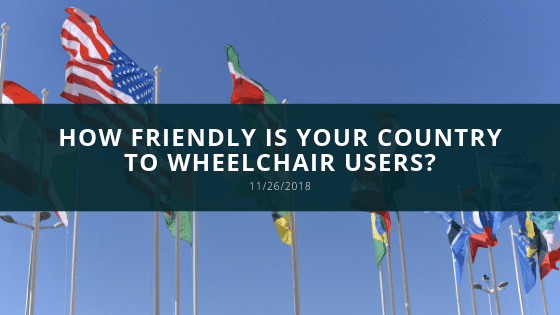 Locations like theme parks and government buildings are not the only places that are wheelchair friendly. Many shopping centers and store have rams or elevators to help wheelchair users have access to go to the stores. Some even have carts that are motor powered to help them get around the store and shop. The United States of America also has strict laws that prevent regular car users with no disabilities parking in a handicap spot. Handicap parking spots are always located closest to store in an attempt to facilitate the shopping experience. It is also placed there to help prevent people with disabilities across the parking lot and risk getting hit.